This hugely popular trumpet player (born in Trieste, Italy in 1939) almost single-handedly brought Italian jazz to international attention. He began playing Dixieland trombone in Turin, but after hearing Miles Davis, switched instruments and embraced the modern style. Other key meetings were with Gato Barbieri, with whom he recorded movie soundtracks in 1962, and Chet Baker. He began to play with Steve Lacy; he also teamed up with South African expatriates Louis Moholo and John Dyani and recorded The Forest and the Zoo (ESP) live in Argentina. In 1967, he moved to New York, playing with Roswell Rudd, Marion Brown, Rashied Ali, Cecil Taylor, and Charlie Haden. In a brief return to Europe, Rava recorded with Lee Konitz (Stereokonitz, RCA) and Manfred Schoof (European Echoes, FMP). From 1969 to 1976, he was back in New York, recording Escalator Over the Hill with Carla Bley's Jazz Composers' Orchestra. After his first album as a leader, Il Giro del Giorno in 80 Mondi (Black Saint), he began to lead his own pianoless quartets and quintets. His recorded output numbers 100 records, 30 as a leader. 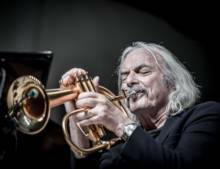 ECM has reissued some of his essential recordings of the '70s, like The Pilgrim and the Stars, The Plot, and Enrico Rava Quartet, while Soul Note and Label Bleu published CDs by his innovative Electric Five (in reality a sextet, as he always excludes himself from the count), which includes two electric guitars. With keyboard master Franco D'Andrea and trumpeter Paolo Fresu, Rava recorded Bix and Pop (Philology) and Shades of Chet, tributes to Bix Beiderbecke and Armstrong, and to Chet Baker, respectively. Also of note are Rava, l'Opera Va and Carmen, gorgeous readings of opera arias. In 2001, he created a new quintet with young talents Gianluca Petrella, Stefano Bollani, Rosario Bonaccorso, and Roberto Gatto, and toured with old friends Roswell Rudd and Gato Barbieri, releasing Easy Living with them in 2004 on ECM. Three years later, after Bollani, who had struck out as a solo player, was replaced by Andrea Pozza, The Words and the Days came out. In 2007, Rava and pianist Stefano Bollani released The Third Man on ECM. Rava followed the released in 2009 with New York Days, a collection of moody originals with a film noir tinge, backed by a band that included Bollani, tenor saxophonist Mark Turner, bassist Larry Grenadier, and drummer Paul Motian. Rava broke in a new all-Italian quintet for Tribe, which was issued by ECM in the fall of 2011. Its members included trombonist Gianluca Petrella, pianist Giovanni Guidi, bassist Gabriele Evangelista, and drummer Fabrizio Sferra. Guitarist Giacomo Ancillotto also guested on the set, expanding the lineup on various selections. Rava made a wide left turn for 2012's On the Dance Floor. Amazingly, the trumpeter only became aware of pop singer Michael Jackson's music after his death, and he became obsessed with it. The album, his tribute to what he considers the late singer's contribution to 20th century music, was recorded with Parco della Musica Jazz Lab at the Rome Auditorium; it is entirely comprised of Jackson's material. On 2015 he recorded a new cd for ECM Label, Wild Dance, with his New 4et with Francesco Diodati, Gabriele Evangelista and Enrico Morello. A documentary film on his life and career was presented on june 12th at Biografilm Festival of Bologna.